Right now you’re probably wondering: What possessed Mitt Romney to insult the Conservative Prime Minister of Britain—on a foreign trip meant to demonstrate Romney’s supposedly superior ability to manage foreign affairs—by criticizing the U.K.’s handling of the Olympic games on the eve of their commencement? This blunder catches Romney in an exquisite trap of his own making. On the one hand, he seems to have genuinely angered David Cameron, a rare European ally in the lonely fight against European-style socialism. On the other hand, Romney’s 11th Commandment is: Thou Shalt Not Apologize To Foreign Leaders, especially when on foreign soil. The guy wrote a whole book about it! How could Romney be so stupid as to hoist himself on this petard? I think I have the answer. First, though, let’s review this gaffe in detail. Here is what Cameron was moved to say in reply, during a visit to Olympic Park: “We are holding an Olympic Games in one of the busiest, most active, bustling cities anywhere in the world. Of course it’s easier if you hold an Olympic Games in the middle of nowhere.” Cameron was referring to Salt Lake City, which of course is not only where Romney supervised the Winter Olympic games in 2002, but also the spiritual home of Romney’s Mormon ancestors. Cameron’s riposte was roughly equivalent to calling Mecca a hick town during a state visit from King Abdullah bin Abdulaziz al Saud. 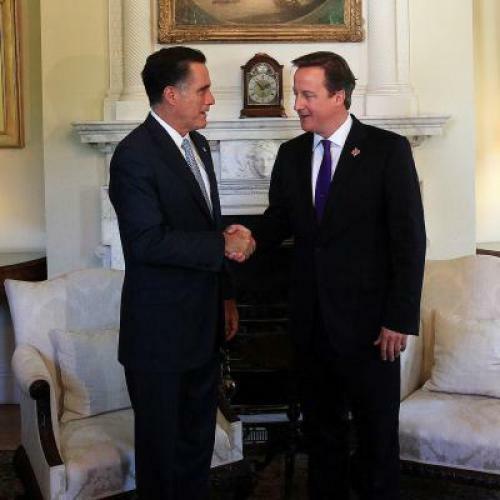 According to the Guardian, Romney “rowed back” his comments after meeting with Cameron at 10 Downing Street. “I am very delighted with the prospects of a highly successful Olympic Games,” he said. “What I have seen shows imagination and forethought and a lot of organization and [I] expect the Games to be highly successful.” Under no circumstances are we to regard this as an apology. It is, instead, an unacknowledged contradiction of what Romney said earlier. Because there are three parts that makes Games successful. Number one, of course, are the athletes. That's what overwhelmingly the Games are about. Number two are the volunteers. And they'll have great volunteers here. But number three are the people of the country. Do they come together and celebrate the Olympic moment? And that's something which we only find out once the Games actually begin. You’ve heard this voice before. It is the voice of a comically self-satisfied man basking in the glory of achieving something very few mortals would be capable of—in this case, running a successful Olympic Games. Indeed, Romney would have you believe that he didn’t just make the Salt Lake City games a success—he saved the Olympics themselves. He grabbed ahold of an Olympic torch extinguished by international scandal and relit the flame. That is the unembarrassed message of Romney’s 2004 book Turnaround: Crisis, Leadership, and the Olympic Games. Romney’s Olympic triumph is what made the difference (at least in Romney’s mind) between his failed 1994 Senate campaign and his successful 2002 gubernatorial bid, which put him on the path to the White House. It is, today, a significant part of Romney’s argument for electing him president. It’s also, as I’ve written before (“No Medal For You”) a pretty weak case. Romney did a perfectly fine job running the Olympics, but so have lots of other people. When reporting my earlier column I asked Lisa Delpy Neirotti, who teaches sport management at George Washington University, whether she could name a single U.S.-based Winter or Summer Olympics—going back three decades—that wasn’t managed well. She could not. But Romney is deeply invested in the idea that it takes superhuman skills to save an Olympic Games from the disaster and international humiliation to which it naturally inclines. The idea that it can be done reasonably well even by a past-its-prime power like Britain is too much for Romney to bear. And I'm afraid he let it show at a very inopportune moment.